The Student/Faculty committee plays an important role in fostering relationships between UT students, faculty, and staff. We organize a variety of events, including luncheons, mixers, and the CNS component of Senate’s Faculty Appreciation Week, in which CNS students write thank you notes to inspirational faculty and staff. At the end of each school year, we host the Faculty and Staff Appreciation Banquet, in which students invite and celebrate professors, TAs, and any other mentors that have helped them along their undergraduate journey. Our events are meant to mutually benefit the faculty and the students by forming relationships that would otherwise be difficult at such a large university. These relationships often grow and lead to other great opportunities! The central event for the committee is the annual Faculty and Staff Appreciation Banquet held every April/May. CNS faculty and staff who have won student-nominated awards are honored in a formal setting. Students from CNS are encouraged to RSVP and bring a faculty or staff member that has had a positive impact on their undergraduate career to the banquet. Our monthly luncheons allow a small group of students to have lunch with professors from the College of Natural Sciences. 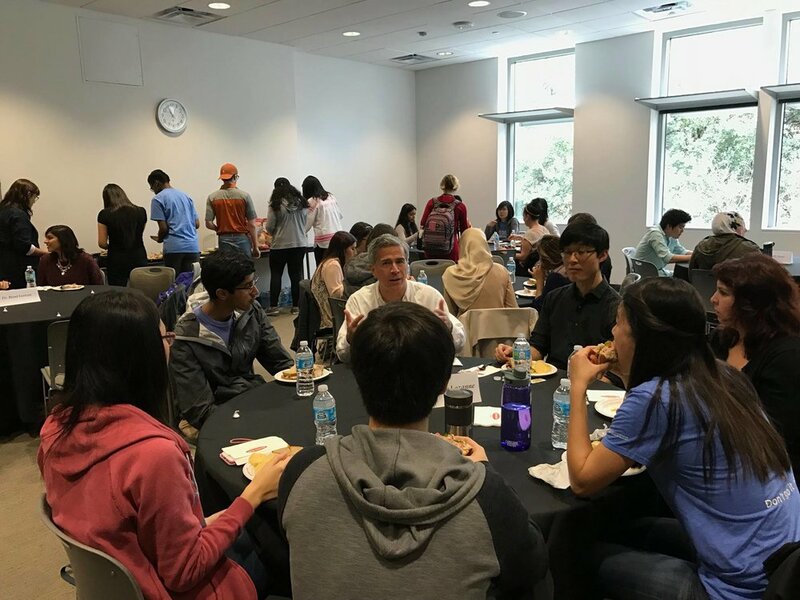 These luncheons help build closer relationships between professors and students and often help students in pursuing other academic opportunities.